A group of parliamentary leaders, led by National Assembly Speaker Moon Hee-sang, left for the United States on Sunday for meetings with American congressional leaders ahead of a second summit between the leaders of the U.S. and North Korea. Moon and the heads of four rival political parties, including the ruling and opposition parties, flew to the U.S. for a weeklong trip aimed at parliamentary diplomacy with the U.S. in the run-up to the summit between President Donald Trump and Kim Jong-un set for Feb. 27-28 in Hanoi, Vietnam. The delegation includes Lee Hae-chan, the chairman of the ruling Democratic Party; the Party for Democracy and Peace's Chairman Chung Dong-young; the Justice Party's Chairwoman Lee Jeong-mi; and Kim Kwan-young, the floor leader of the minor opposition Bareunmirae Party. The main opposition Liberty Korea Party's floor leader Na Kyung-won will depart later in the day on her own to join the delegation in the U.S. The trip, which will last till Feb. 17, marks a rare official joint American trip by rival political party leaders ahead of a major diplomatic event. 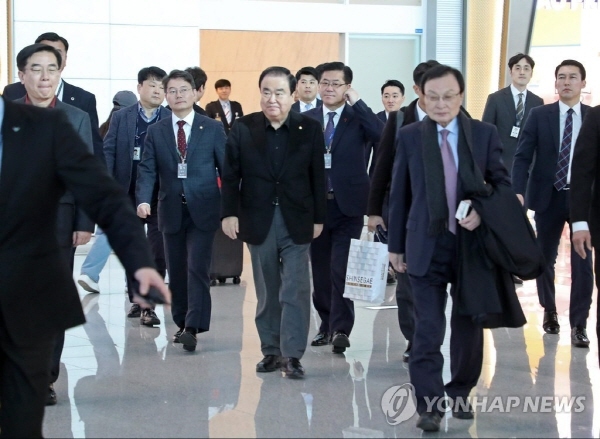 The delegation also includes the leader of the assembly's Foreign Affairs and Unification Committee, Kang Seok-ho of the main opposition party, and committee members such as Lee Soo-hyuck, a former North Korea nuclear negotiator-turned-lawmaker with the Democratic Party. The weeklong trip will include meetings with Nancy Pelosi, the speaker of the House of Representatives, and other lawmakers, with an aim to rev up the two countries' commitment to their treaty alliance at the parliamentary level. The meetings will also involve discussions on ways to help denuclearize North Korea through diplomatic efforts including the upcoming U.S.-North Korea summit. The South Korean delegation will kick off their American itinerary with a visit on Monday to the Korean War Veterans Memorial in Washington, D.C., followed by a meeting with Joseph Sullivan, U.S. deputy secretary of state. Their meeting with Pelosi is scheduled for Tuesday. The delegation will also hold meetings with Chair of the House Foreign Affairs Committee Eliot Engel, House Minority Leader Kevin McCarthy and Chair of the Senate Armed Services Committee Jim Inhofe. On Wednesday, the delegation will hold another meeting with Jim Risch, the chairman of the Senate Foreign Relations Committee, before flying to New York, where they will host a gathering of Korean-Americans. National Assembly Speaker Moon Hee-sang (C) and other parliamentary leaders head for the United States on Feb. 10, 2019, for their parliamentary-level diplomacy with American lawmakers in the run-up to the second U.S.-North Korean summit.